It’s official! Samsung has sent out press invites for its highly-anticipated Galaxy S9 launch event. The media invite also teased that the upcoming Galaxy flagship would focus on the camera. Samsung will hold a Galaxy Unpacked event on February 25, 2018 at 6 PM CET (that’s 12 PM ET or 9 AM PT) in Barcelona. The event would take place just a day before the Mobile World Congress (MWC) kicks off. 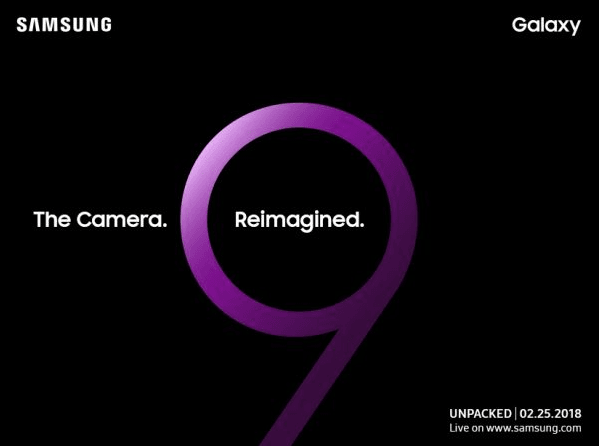 The Galaxy S9 launch event will be live streamed via Samsung’s website. The media invite includes a large “9” on a black background. The invite text reads, “The Camera. Reimagined.” It would be interesting to see how Samsung improves the camera on its upcoming models. The larger Galaxy S9 Plus is expected to feature a dual-camera setup that would be arranged vertically on the back panel. Samsung has traditionally refreshed the Galaxy S series at the Mobile World Congress. Last year’s Galaxy S8 was an exception because of the Galaxy Note 7 fiasco. The S8 was unveiled in March in New York. The Galaxy S9 launch event invite says, “If a picture is worth a thousand words, the latest member of the Galaxy family as a lot to say.” Samsung would also showcase the device in its booth at the MWC. Earlier this week, the MWC website had mentioned that Samsung would hold a press event on February 26 at 3 PM CET, which sparked speculations that the Galaxy S9 and S9 Plus could be showcased at the event. However, ETNews had learned from inside sources that the devices would be unveiled on February 25. The official announcement has put an end to the rumors. According to the rumor mill, the Galaxy S9 would sport a single camera. Samsung is said to differentiate the two models by keeping the dual camera system exclusive to the Galaxy S9 Plus. The regular S9 could still see a significant improvement in photography. According to recent reports, Samsung would use a new Tetracell technology to improve low-light images, offering an upgrade over Dual Pixel. A leaked Galaxy S9 box has revealed that the phone’s camera would have a variable aperture of f/1.5 to f/2.4 to offer DSLR-like capabilities. The phones are said to feature a Super Speed camera with a ‘Super Slow-mo’ mode and optical image stabilization. The Galaxy S9 would sport a 12-megapixel sensor while its bigger sibling would feature two 12MP sensors on the back. The devices would include an 8MP camera on the front for selfies. Ahead of the official unveiling, the Galaxy S9 has been spotted in a couple of hands-on videos. The videos offer a glimpse into the upcoming flagship phone’s design, confirming that the handset would feature an Infinity Display with thin bezels. One of the videos was posted on Chinese microblogging site Weibo on Wednesday. It shows off the S9’s touch sensitivity. According to SlashGear, the Galaxy S9 measures 147.6 x 68.7 x 8.4mm, which makes it smaller, wider, and thicker than the Galaxy S8. The Galaxy S9 Plus measures 157.7 x 73.8 x 8.5mm, meaning it would be thicker, wider, and smaller than last year’s Galaxy S8 Plus. The rumor mill claims the Galaxy S9 and S9 Plus would offer the same battery sizes as their respective predecessors. We can still expect Samsung’s upcoming phones to offer a better battery life than last year’s models because they would feature more energy efficient processors. The US version will be powered by Qualcomm’s Snapdragon 845. Markets such as Europe, India, and others would get the units running Samsung’s in-house Exynos 9810 chips. The Galaxy S9 and S9 Plus are also said to offer machine learning chips for AI tasks. The Galaxy S9 is rumored to have just 4GB RAM, same as its predecessor. Though 4GB is enough to handle even the most demanding tasks, most flagship Android phones come with 6GB RAM now. Samsung would include 6GB RAM in the Galaxy S9 Plus to differentiate it from the smaller model. The S9 and S9 Plus will continue to feature the same 5.8-inch and 6.2-inch screens with an 18.5:9 aspect ratio. In terms of storage, the phones are expected to have 64GB and 128GB as the standard storage options along with a microSD card slot. There have also been reports that Samsung could launch the Galaxy S9 Plus with a 512GB storage variant for a few specific markets.